Abstract: Cutaneous metastasis from primary visceral malignancy is a relatively uncommon clinical entity, with a reported incidence ranging from 0.22% to 12% of all malignancies. 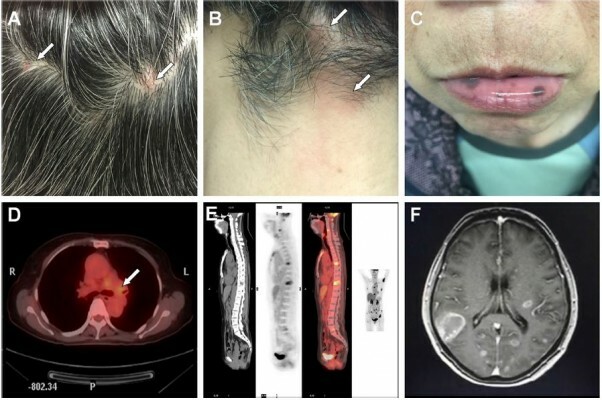 Here we report a 64-year-old asymptomatic female patient with Peutz–Jeghers syndrome presenting with multiple scalp metastases as the initial manifestation secondary to lung adenocarcinoma. Subsequent lung computed tomography scan showed large masses involving the left upper lobe associated with extensive mediastinal lymphadenopathy. After treatment with an epidermal growth factor receptor inhibitor gefitinib, the size of the tumor in the lung reduced significantly and the condition of the patient also gradually improved. Our case demonstrated that scalp metastasis could be the first sign of an internal malignancy. Asymptomatic elderly patients presenting with multiple, painless, immobile cutaneous nodules should be considered for further investigations to rule out the underlying primary cause. Metastasis to the skin is often a preterminal event that heralds poor prognosis.